Who here doesn’t love a great mystery? And going back and rereading the earlier years of Amazing Spider-Man has got my brain fixated on one of the most famous mystery-storylines ever told in the pages of ASM: the identity of the Green Goblin. 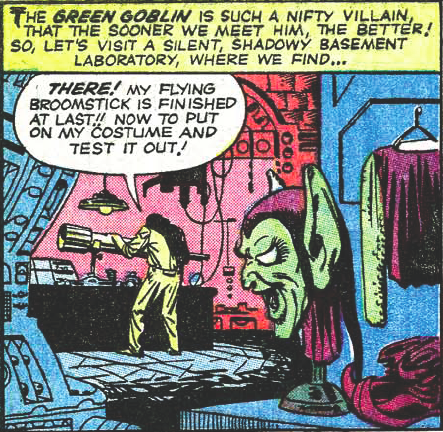 The Goblin, who goes on to become Spider-Man’s main supervillain (an argument could be made that ordinary human newspaper publisher J. Jonah Jameson, who tortures Spidey through yellow journalism, is the web-slinger’s arch “nemesis”) is first introduced in ASM #14 and remains shrouded in mystery until more than two years later when his identity is revealed to be wealthy businessman and chemist Norman Osborn, the best friend of one of Peter’s college classmates (and later best friends) Harry. When I think about the profound negative impact the Goblin has had on Spider-Man’s life – he’s the emotionally abusive father of one of his best friends; he KILLS Spider-Man’s girlfriend Gwen Stacy; his own death in battle with Spider-Man drives his son so insane that he becomes hell-bent on destroying Spidey, thereby pitting the two friends against each other – I have to wonder where any of these plot developments in the cards from the beginning? And if so, how could the Goblin’s identity really be a point of debate for the creative team? 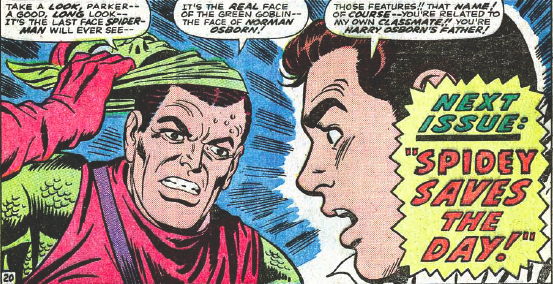 Part of what made Osborn such an effective choice, especially after issue #39 where not only does he reveal himself, but he also unmasks Spider-Man as Peter, is the fact that he’s a “real” human from Peter’s universe and the father of a classmate. Peter is so protective of his own identity that the concept that someone who “knows” him from his pedestrian life also knows about his superhero double-life, is downright terrifying. And down the road, when Spider-Man and Goblin engage in battle, it puts Peter/Spidey in a tough predicament because despite the fact that this villain is bent on killing him, his moral center is conflicted by the idea of hurting his friend’s father. When you include the fact that Peter is an orphan and the only father figure he had in his life, his Uncle Ben, was killed, that makes the Norman/Harry/Goblin dynamic even more complicated. Even after Goblin kills Gwen, Peter/Spider-Man stops short of beating him to his death, despite his burning rage. Instead, the Goblin is impaled by his own glider and (temporarily) killed. So after considering all of this, I have to believe that at least some of the Goblin’s story-arc was preconceived by someone from the very beginning. Of course, thinking that it was ALL plotted out – from Gwen Stacy’s death and beyond – is a reach, but the reader should get the sense right away that there’s something special about the introduction of this new villain. And the fact that his identity was such a big secret for so long, Marvel had to make the reveal matter – a regular Joe Schmo with superpowers wasn’t going to cut it. Otherwise, the Goblin would just end up being one of the other countless villains in Spider-Man’s life who have wreaked havoc, but not have had the earth-shattering affects the mysterious man in the green mask ended up having. So Ditko’s supposed novelty of making him a random guy off the street wouldn’t have even been an original idea in the ASM series. One of the beautiful things about long-form media like comics is that long arcs like the Osborns’ can seem planned out from the beginning, even if things just fall into place naturally over the decades.